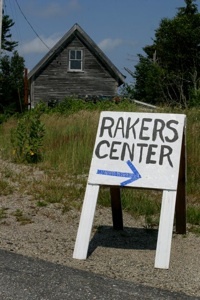 Several organizations are working together in Maine to assist the migrant workers. Because migrant workers move from place to place and often hail from severely impoverished economic backgrounds, they are confronted with many obstacles. They often don’t have the financial means, physical access, or language proficiency to connect with medical services. The Maine Migrant Health Program has proven to be an invaluable resource in overcoming the obstacles to health care. 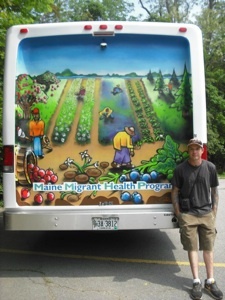 The Maine Migrant Health Program is Maine’s only farmworker health organization. It was established in 1991. Each year over 1,200 migrant workers and their family members receive health care due to their efforts. 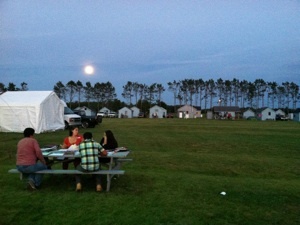 Three mobile units and medical and nursing teams provide care to the farmworkers at the various harvest camps. They also help coordinate and connect migrant workers to many community providers throughout the state. 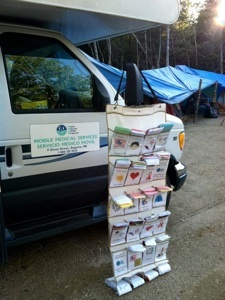 In addition to reaching the migrant workers during the blueberry harvest, Maine Migrant Health Program sends their mobile units on a year-round basis to other agricultural operations such as areas where migrant farm laborers are planting trees, making wreaths, picking apples, gathering eggs, or raising chickens. Farming often causes anxiety because of the many unpredictable factors such as market prices, weather, reliable skilled labor, etc. Migrant workers often experience even more heightened levels of stress. Many have chosen to travel exceptional distances to various harvests throughout the year. They often face severe loneliness and worry from being separated from their families in their home country. Because stability and solid educational opportunities are often not possible due to their constant migrations, proficiency in English is often limited or even non-existent. Their low incomes often correspond with worries about meeting costs for food and transportation. Health concerns are often placed on the sideburner. Hypertension, depression, heat stress, dermatitis, urinary tract infections, dental issues, back and joint pain, and parasitic infections are often common conditions that migrant and seasonal workers face. Farmworkers are often exposed to pesticides and it is crucial that they have a full understanding of the proper methods of application and disposal. 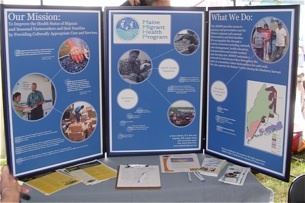 The Maine Board of Pesticides Control works with the Maine Migrant Health Program to train migrant and seasonal workers to avoid pesticide risks under the EPA Worker Protection Standard. Because of the frequent exposure to chemicals, farmworkers are faced with a high percentage of toxic chemical injuries and skin disorders. The occurrence of eye injuries and headaches are also fairly common. 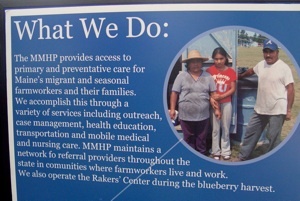 During the blueberry harvest when hundreds of migrant workers may be in the Washington County area, the Maine Migrant Health Program sets up the Farmworkers’ Resource Center. This past year the Raking Center was headquartered at the Town Hall in Columbia. In addition to the mobile medical unit, migrant workers can access dental care, social services, a food pantry, legal aid, and educational services. There have been many testimonials about the importance of the work with which the Maine Migrant Health Program is involved. This non-profit organization clearly understands that every human being has the right to access health care. They also understand the concept of providing options for care that can be presented in culturally-appropriate ways. According to the Maine Department of Labor, 84% of farmworkers in the United States speak Spanish as their native language. There are Maine Migrant Health Programs staff members who are trained to speak English, Spanish, and Haitian Creole. Bilingual conversations and literature help the migrant workers to overcome the stress of trying to understand the communication that takes place. When Unique Maine Farms had the opportunity to visit one of the blueberry harvest camps, Maine Migrant Health Program Camp Health Aide Coordinator, Ben Hummel, was working with two promotoras de salud. These two women had stepped forward to be community educators and had prepared very well to deliver a talk in Spanish to interested migrant workers about colorectal cancer. Thanks to the foresight of the Maine Migrant Health Program, Certified Application Counselors are available to help guide farmers who live in Maine, migrant farmworkers, immigrants in Maine, Spanish speakers, Haitian Creole-speakers, and members of the general public with educational resources, assistance, and counseling for the enrollment process for the Affordable Care Act. recipient of several awards for their vital work. 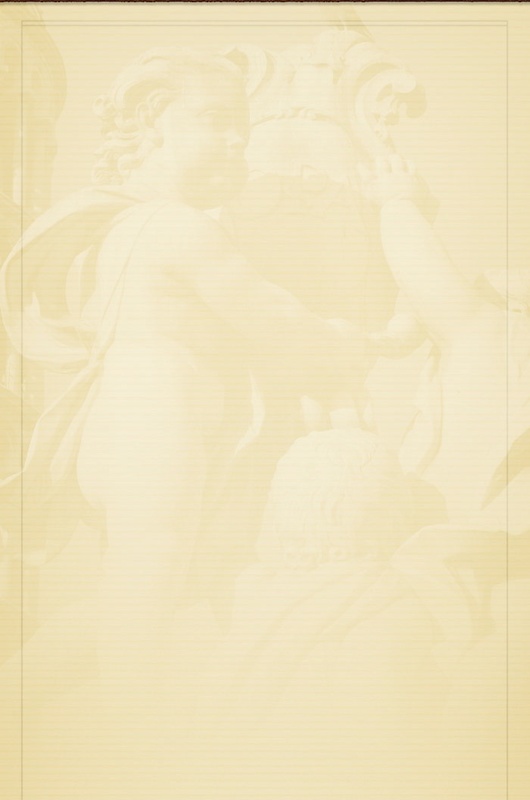 In 2006, they received the Elizabeth Noyce Award for Nonprofit Excellence from the Maine Community Foundation. That same year they also were recognized with the Golden Lantern Award for their Innovative Promotora Program by Migrant Health Promotion. In 2008, they were given the Sister Cecilia B. Abhold Award for Innovation in Health Outreach Services to Migrant and Seasonal Farmworkers by the Farmworkers Health Services. 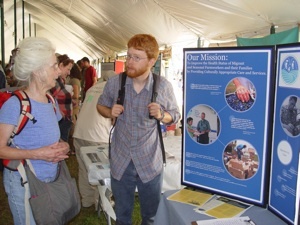 Ben Hummel, the Camp Health Aid Coordinator of the Maine Migrant Health Program, speaks to a visitor to the Maine Migrant Health Program booth at the 2013 Common Ground Fair. 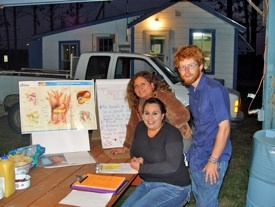 Ben Hummel of the Maine Migrant Health Program is pictured with Joanna Villa and Berta Lopez, two promotoras de salud who led a workshop on colorectal cancer at the Wyman’s blueberry harvest camp in Deblois.